At Toyota Park, your Chicago Fire square off against D.C. United in a semifinal American soccer match of the 100th edition of the Lamar Hunt U.S. Open Cup (kind of like English football's FA Cup). Yes, you're right, Major League Soccer hasn't been around 100 years, but this is the Fire's chance to make its mark and tie for the most championship victories (five). An international fleet of nine tall ships is coming into port at Navy Pier today in grand style for the Parade of Sail. They'll be here all week, and you can tour the ships, watch them race, or go for a cruise on the high seas of Lake Michigan. 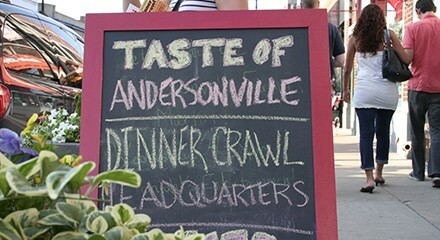 The Taste of Andersonville Dinner Crawl is a tour of the neighborhood's top eateries. Stops include M. Henry, the Wooden Spoon, and the Fireside. See their website for more.